Defensive players to the fore; it was differing fortunes for that style of play at the quarter-final stage of the Women’s Singles event at the Seamaster 2018 ITTF World Tour Platinum German Open in Bremen on Saturday 25th March. It was defeat for China’s Wu Yang, success for Korea’s Suh Hyowon. Kasumi Ishikawa, the no.2 seed, beat China’s Wu Yang (14-12, 7-11, 11-4, 11-8, 5-11, 11-7); Suh Hyonwon, the no.14 seed emerged successful in the all Korean duel; she ended the progress of Yan Haeun (11-6, 12-10, 3-11, 12-10, 4-11, 11-4, 11-7). 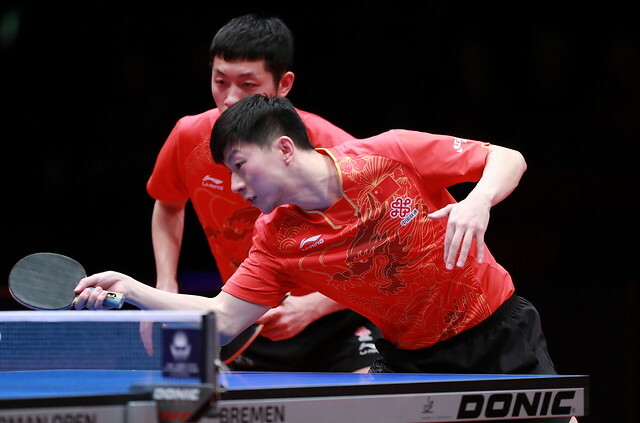 Both Wu Yang and Yang Haeun had been required to compete in the three day qualification tournament. The success gained by Kasumi Ishikawa reflects her progress, especially her improvement against defensive players. At the semi-final stage of the recent 2018 Team World Cup in London, she beat DPR Korea’s Kim Song I in three straight games (11-3, 11-8, 11-7; in the opening round in Bremen she accounted for colleague Hitomi Sato (11-5, 11-6, 11-6, 11-7). Arguably, she is well acquainted with Hitomi Sato and perhaps the result does not carry great weight but when considering her performances in opposition to Wu Yang, a true reflection is revealed. From the 2009 ITTF World Tour China Open to the 2013 Asian Cup in Hong Kong, Kasumi Ishikawa lost all six encounters. In 2014 she won a titanic seven games duel on the ITTF World Tour in Kuwait before in 2016 losing in Germany. However, last year when they met at the Seamaster 2017 ITTF World Tour Platinum German Open, Kasumi Ishikawa won; it was a portent for today. Success for Kasumi Ishikawa against the “Bodyguard”, the player who in the past has rarely lost to foreign opposition and protects her colleagues from foreign foes; the defence is classic. The remaining quarter-final Women’s Singles contests will be played later in the evening.